I'm always up for a good sounding book on seeking God, especially when you have limited time as a mom. The premise of Mom Seeks God sounded good and because of that, a copy of this book was sent to both a friend of mine and myself so that we could read it "side-by-side" as it were and compare notes. Would it encourage us? What would we glean from it? I can't tell you that either my friend (Elisha) or myself were very thrilled with it. Our reasons for the naysaying are below. I always read the Forwards and Introductions in books. If the author has any notes to present before they lay out the bulk of their beliefs and arguments I'm ready to hear about them. 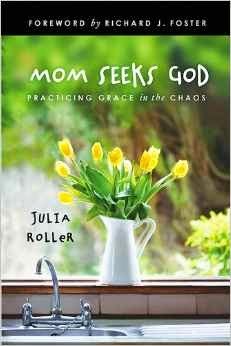 In the Introduction to this book, author Julia Roller notes that she once wrote a devotional entitled A Year With God that was designed to "lead readers through the key biblical passages about eighteen different spiritual disciplines, such as prayer, silence, solitude, meditation, fasting, simplicity, and so on." She confesses that as she was writing this devotional, she would frequently write out the phrase, "In your daily prayer time . . ." which made her feel a bit "uncomfortable" as she herself had no daily consistent prayer time of her own. Now, I'm not asking for perfection in the authors of the books that I read because they can't provide it. However, when you are about to launch into a book which is meant to instruct mothers how to seek God in the busyness, I am looking to learn from a person who has some good habits of their own and some thoughtful, wise experiences to pass along to me. And when the author tells me straight away that they preach but don't practice my antenna goes straight up and I find myself on high alert. Add these two things to the fact that my kids are older than Roller's and I felt like I was looking behind me for advice instead of in front of me. I'm not saying that a younger mom has nothing to teach me because that's not true at all or by any means. I can/could and frequently do learn how to parent better at the advice of less experienced mothers. But I'm back to the idea of asking specific people for advice with specific questions in my head. I don't begrudge Roller her early mothering struggles; I think they are good and we all must go through them to learn and to grow. There is great beauty in the beginning stages. But, again, if I'm going to specifically seek out advice, I'm more likely to look to those ahead of me in the game. In the end I have to tell you I couldn't finish this book. I read about 5 chapters mostly out of morbid curiosity but I didn't find much that was useful to pass along to young moms. I can think of much better books to recommend starting with Loving the Little Years (linked) and Don't Make Me Count to Three (linked). I'm tired. Like every mom out there, I presume. I need grace in the chaos. And I desperately need God. Desperately. Which is what initially drew me to read Mom Seeks God . I wish Julia was my friend and we could head off to coffee and I could hear, in person, all that God did in her life over that year of seeking God through the practice of spiritual disciplines. And perhaps, over coffee, I would delight with her to see how she has grown and changed throughout that year. I would rejoice with her to see the work of God in her life, leading her to greater Christ-likeness. And I would pray with her that she would continue to open herself "to God enough to hear God's leading" (pg. 170). However, as I read Julia's story, I find myself feeling both confused as to the reason for this book. The book feels too much like a blog post, or conversation one has over tea. It lacks an element of depth, encouragement, and challenge for the reader that leaves me feeling like saying, "What else?" Her desire to grow and submit to God is honorable. And I truly get why she believes practicing spiritual disciplines will help her grow. Maybe they will. Yet, I would argue, it is not in the disciplines we practice where we find life, but in the daily grace given to us to live in an abiding relationship with Jesus Christ where we find the whole of a Christian's walk with God. Is it not in the love poured in and through us that we find and live out the Great Commission? But to be fair, what type of love for God is without prayer, fellowship, submission, study and the other disciplines Julia Roller discusses? It seems that, while the disciplines she analyzes are good, Julia's book is lacking in what matters most: a focus on the why of spiritual discipline. Do we practice spiritual disciplines to "produce in us a certain kind of person" (pg. ix) or because "little eyes are watching" (pg. xviii) or are we acting out of thanksgiving and a complete and utter consuming love for God? Jesus sums up the law and the prophets - all the words, rules, practices, and disciplines of God - in this: Love the Lord your God with all your heart and soul and strength and mind, and love your neighbor as yourself (Luke 10:27). I find it hard to be excited about a book that spends an inordinate amount of time discussing how to "connect with God through [spiritual] practices" (pg. xxi) and never mentions that we choose to connect with God because we love Him and He first loved us. The tone of her writing implies that she is reluctant and dragging her feet to go to God, yet chooses to do it anyway because she should or because it will be good for her. God protect us from choosing Jesus only because we ought to or for our own benefit alone. I believe this very attitude is what has given the world the idea that Christianity is a set of rules and regulations to follow and is why they don't see any attraction to giving their life to legalistic practices. If they saw overflowing love for God and others that resulted in joy filled service, devotion, and spiritual discipline, perhaps they would wonder about this God whose followers are filled with life, joy, peace, hope, and love. I can hardly blame her for this following-God-is-a-lot-work attitude though. Our flesh puts up a good fight against the Spirit at work within us, lying convincingly, as in the garden, that we know better than God what is good for us and others. I am not exempt from this mindset, but I pray God will constantly refine our motivations to seek Him for His sake alone and not for our own purposes. Another struggle I find I have with Mom Seeks God is how she never mentions, as a spiritual discipline, following Jesus in making disciples of all nations by loving, living, and putting our faith in Jesus Christ. How useful is it to discuss spirituality and never mention Jesus' great commission - "Go and make disciples of all nations"? What good is our fasting, our prayers, our fellowship, and our worship if not to love God by obeying Jesus' call to bring hope to a lost world that is dying without Him? This is probably where I find my greatest criticism of the book. The religious leaders of Jesus' day spent their time in fasting, in prayer, in fellowship, and yet were called spiritual poor by the only true Judge of spirituality. How sad a state my soul would find itself in, if I mastered all these disciplines and learned much about seeking God, but never found the true author of my faith and submitted myself in obedience to His calling? Because what are all the disciplines in the world worth without love (1 Corinthians 13) for God and mankind? Julia focuses the book on what will enrich her relationship with God and seems to entirely miss that God's priorities are not in making us the best version of ourselves (although that happens through and in a relationship with Him), but reconciling a broken world to their loving Savior. Mom seeks God analyzes the fruit of a relationship with Jesus Christ. But is it helpful to a garden to analyze the tomatoes or is it better to actually do some planting, weeding, and pruning? The fruit of an abiding relationship with God (spiritual discipline) is important, but those who practice spiritual discipline as a result of human effort or self-betterment will be people who are "constantly learning but never able to come to a knowledge of the truth" (2 Timothy 3:7). And isn't it Jesus who says that a good tree will bear good fruit and a bad tree will bear bad fruit? As we abide in Him, we will bear the good fruits of the Spirit (Galatians 5:22-23). Are we to worry about trying to dissect good fruit or ought we to simply rest in Him allowing Him to produce the kind of fruit in our lives that He desires? Perhaps it would be better for us to come face-to-face with the loving and Almighty God than it is to have an "emotional experience of coming face-to-face with [our] own weakness" (pg. xxi) through the attempt of spiritual discipline. Although, those who have been forgiven much, love much, so perhaps a proper view of our desperate need for God's grace will lead us into deeper relationship with Him resulting in spiritual disciplines that are borne out of a love for our Savior who has forgiven us much. In all, while I found it mildly interesting to read her experiences, I wasn't compelled by her story to keep reading, to keep following Jesus, to fall more in love with our Savior, or to grow at all in my walk with the Lord. In fact, reading her experiences has left a sour taste in my mouth about how many Christians view following Jesus and has broken my heart for the American church in new and profound ways. In truth, I am more tired and discouraged for having read Mom seeks God than I was before embarked through this book. Many thanks to Litfuse Publicity Group for sending copies of this book to both myself and to Elisha in order to facilitate this review. You can check out other reviewers opinions at the Litfuse Publicity Mom Seeks God webpage. Neither Elisha nor myself received any additional compensation for this review and all opinions are our own (should you doubt it). For me, ultimately, the final authority on ANY sphere, is the Holy Bible! I too read reviewed this and had all the same feelings you ladies had. Thanks for the reviews, ladies. I have a feeling I would feel the same way, based on your thorough reviews. I agree completely with both of you! I cringed when I saw The Shack reference. Honestly, I find it hard to take anyone serious who does like that book. Of course, there were several remarks that made me cringe a bit.